Budget Cards are a great way to spend directly from the budget and not have to worry about divvying funds to yourself or a specific individual. 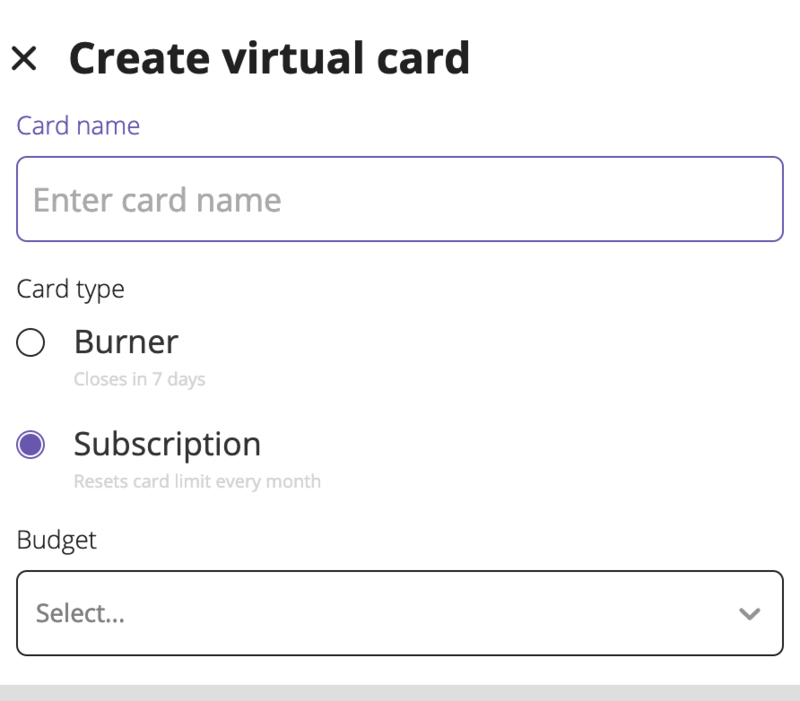 Budget Subscription Card is a type of virtual card that you can create with a monthly limit that is tied to the budget directly. 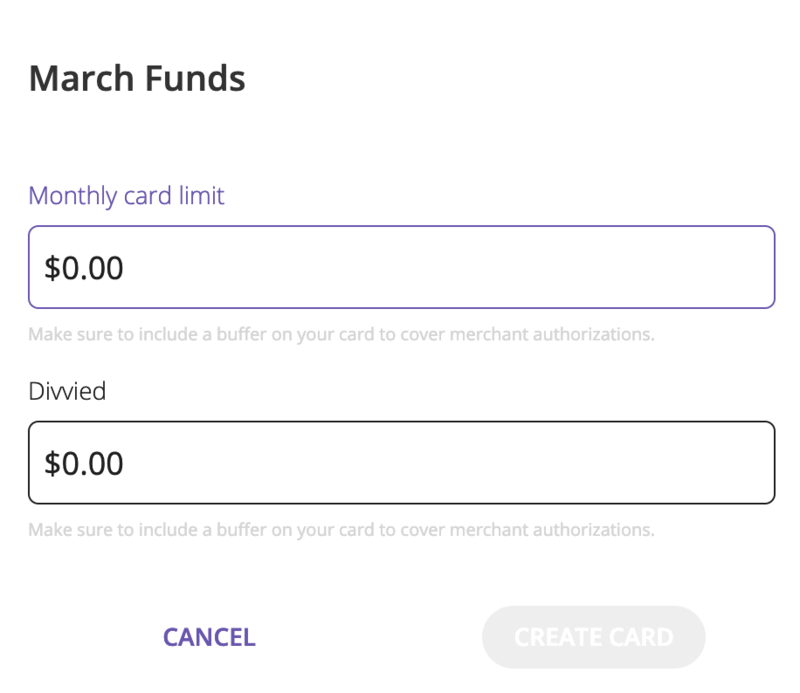 When you set a limit for the card, it will divvy funds directly from the budget to the virtual card. You won't need to worry about divvying funds to yourself directly. Burner Cards are designed for those one time purchases that you make online. The designated expire time is 7 days from the time you created the card, but you can extend this expiration date out. You can still change the amount of funds on this card as well as you need to. Creating these budget cards will allow you to use them as one time purchases or a card set for specific vendors. To create a budget card, you must be an admin or budget owner. There are two different options to get started. One way to start going to the budget tab in the navigation bar, select your budget you wish to create a card in, then click on the virtual card section. You can click "create virtual card" on the right hand side. This will automatically assign the card you are created to the budget you selected. The other way to get started is to select virtual cards on the left hand side in the navigation bar and then select create virtual card. Remember, if you choose this way you will need to select a budget this card is tied to. After you are in the create card section, here is a step by step guide. Choose if this card is a burner card or subscription card. Burner cards do expire after 7 days unless specified for a different date. Assign a budget to the card. Assign a card owner. There can only be one person assigned to a virtual card and you won't be able to reassign this card to a different owner at a later date. Choose a card limit for the month you are currently in. Choose a category for purchases on this virtual card. This category will be assigned to all purchase made with this card. You may need to select any additional fields required for that budget. You now have a virtual card! The only person who can see full card numbers for this card will be the card owner. As an admin or budget owner, you can view the last four of the card number to keep track of spending on that card.